The Japan Society for Cell Biology (JSCB) and the Editorial Board of Cell Structure and Function aim to ensure that the journal keeps pace with these developments while maintaining an independent outlook and a fundamentally strong ethical foundation. 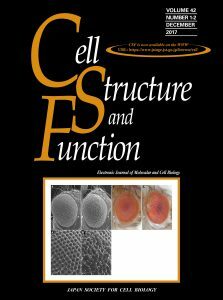 Cell Structure and Function has been free to access online via J-STAGE for many years. This has been a boon for readers, as demonstrated by the increasing number of article downloads. To keep pace with competitor journals and to offer authors and readers even more benefits, Cell Structure and Function has moved to a gold Open Access model. All published manuscripts submitted after 1 October 2016 are fully Open Access. Of course, the journal will remain freely available to anyone with an Internet connection. The most significant change is that authors will retain the copyright in their publications and will grant the JSCB and the journal a license to publish their work. The journal will publish the works under the Creative Commons Attribution (CC BY) 4.0 International license, which allows various uses without any need to contact the publisher or authors. Creative Commons licensing has promoted sharing and increased readership over the past 10 years; more details about the CC BY license can be found on the Creative Commons website. The ongoing development of J-STAGE highlights how quickly the underlying technology of article delivery has changed. From humble beginnings, J-STAGE now provides full HTML for Cell Structure and Function articles and offers an up-to-date submission system. The journal also has full LinkOuts from PubMed as well as Chemport functionality. All these improvements encourage user discovery and usability, and we are excited to introduce upcoming developments as they become available. As journals grow and develop, so too does the workload and the diversity of expertise needed to handle the variety of submitted manuscripts. In response, Cell Structure and Function changed to a more distributed editorial model in 2005. The Editor-in-Chief assesses each manuscript and allocates an Associate Editor to act as the Monitoring Editor. The Monitoring Editor assigns two referees and, based on their reviews, decides whether the manuscript requires revision. The Editor-in-Chief makes the final decision on each manuscript based on the Monitoring Editor’s recommendation. The result is that the best expert handles each submission and the average turnaround time from submission to first decision has decreased. The journal’s underlying infrastructure is vital to its successful operation, but what is most important is that Cell Structure and Function’s content is of the highest possible quality and interest to our readers. We are putting in place a number of plans to ensure that we continue to improve the journal’s output and our service to readers and authors. This includes updating our policies – spanning editorial procedures, peer review, copyright, data, ethics and more – to ensure that Cell Structure and Function continues to meet international standards for high-quality journals. These policies will be published over the coming year and we ask you to read and follow them. In addition, we will actively seek new content by commissioning important contributions, to reinforce Cell Structure and Function’s role as a valuable outlet for the best original research and reviews in cell biology. We are confident that these developments will add to the journal’s reputation and will be reflected in relevant metrics such as the Impact Factor. We hope you will join in our success by submitting your best work to the journal. We believe that the future of Cell Structure and Function is bright, and we will continue to ensure that it is a vital resource for JSCB members, scientists, researchers and anyone with an interest in molecular and cell biology. Despite the changes to come, one thing remains constant: researchers need to find excellent, high-quality publications in order to undertake effective research. As such, Cell Structure and Function is committed to delivering relevant information to researchers and remaining a vital part of their toolkit.